[AUTO] Limit Break 4 (This ability is active if you have four or more damage):[Counter Blast (1)] When a «Narukami» rides this unit, you may pay the cost. If you do, your opponent chooses two of his or her rear-guards, and retires them, and choose your vanguard, and that unit gets [Power]+10000 until end of turn. ...this is actually a relatively interesting card in my eyes. On one hand, you lose the ability to freely choose what to retire and it costs a Counterblast to even do the effect, but on the upside, instead of knocking off a single rear-guard, you retire 2 rear-guards, which, personally, justifies the inability to choose and the payment of the effect. The 10,000 point boost shouldn't even be mentioned anymore as every Break Ride grants this bonus from the get go. 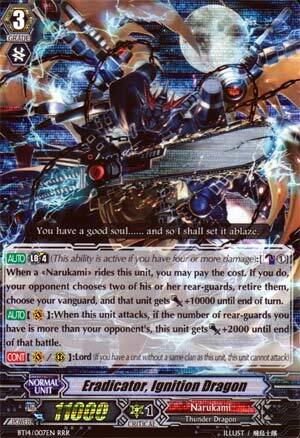 With that said, this is definitely better than Vowing Sword Dragon and is a nice welcome to the Narukami clan. Next Time: What card can really cause a storm of problems if you use Ignition Dragon with it? Narukami's 2nd Break Ride to come out in English is third this week, Ignition Dragon. For CB1 and -1, it grants 10k as usual, and then the opponent retires 2 of their rear-guards of their choice. So what we have here is an overall +1 for CB1. Not bad, but like most other Break Rides, not that explosive. Still, finding something to replace my Vowing Sword Dragon in my own Descendant deck was nice, since at least it gave Zuitan something to do other than be there for Strike Dagger. But enough about me. Ignition Dragon is nice to have for when you need time to hit your ace who can combo well with him, like Descendant. Not really anything special by himself, but he's cool.